Despite being around for a couple of years, OptionsClick has already established its reputation as a reliable and secure binary options broker. One could argue that their generous and honest approach did much to influence the way binary options trading is being done. This does not mean that OptionsClick has not benefited from its reputation and position; a huge number of clients flocked to them and still continue to do business to this day. It is one of the first fully regulated and trusted brokers on the modern market. OptionsClick site seems more focused on relaxing its future patrons than getting them to start trading as early as possible – a sensible and noteworthy attitude. Instead of popping a trading platform the moment you enter its site, you are greeted by a wide selection of tutorials, coming in different forms: webinars, online tutorials and eBooks, for the most part. Those should help you master the basics behind binary options trading, if you haven’t done so already. If their “trading academy” is not your thing, you can explore the interactive menu and all the bonuses and prizes that await you. Every now and again, OptionsClick organizes a tournament for the best binary options traders where they can compete for various prizes (like a cash prize or a latest Samsung Galaxy or something). Basically, you collect points simply by trading binary options and making deposits onto your account, although it is unclear if it applies on currencies other than the U.S. dollar, Euro and British pound. 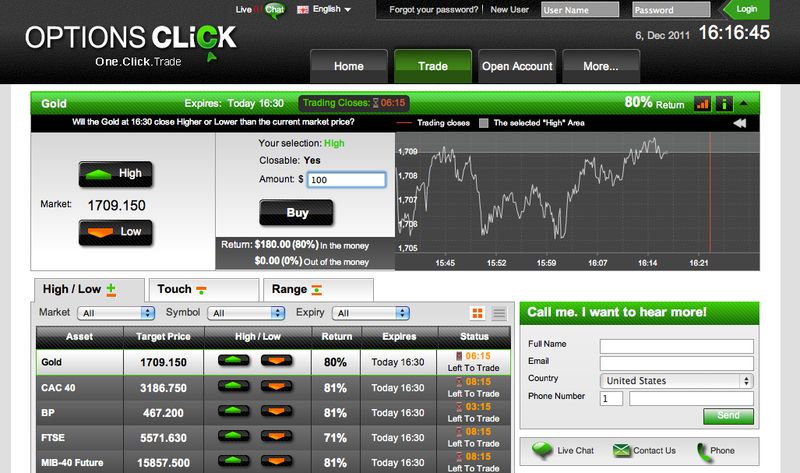 As for the trading platform, that of OptionsClick features a simplistic design and approach. Naturally, most binary options on offer fall into the High/Low category, with above/below subcategory also available. Basically, you have to guess if the price of a commodity (or a currency pair, stock etc.) closes higher or lower than the target price on display. The One Touch options mostly concern currency pairs, although an occasional commodity, like oil, also pops up; this time you’re guessing if the market price is going to touch the target price within the specified time period or not. Range binary options are slightly different. The selection of financial instruments is even smaller, but the main change is that this time you need to guess if the price ends up within a certain range or not, when the binary option expires (you have the exact time and date on display). Finally, there are “60 seconds” binary options, which can actually be set to expire in 1, 2 or 5 minutes, depending on your plans. Otherwise, they function as typical High/Low binary options. OptionsClick does feature an interesting bonus policy, offering a 100% bonus on your first deposit, and 50% on the second and third deposit. Subsequent deposits are not affected, and the total amount seems to be capped at $10,000. Minimum deposit is $100, if you wish to trade on their platform. Payment solutions are diverse, as they take credit cards, Neteller and naturally Skrill.